It peaked in late November. Artifact has shed a lot of its early adopters, according to figures from SteamCharts and SteamDB. In the last 24 hours, it peaked at a not insubstantial 12,670 players, but that’s quite the drop from the 60,740 concurrent players from November 29. It’s also gone quite a bit lower. It launched two weeks ago. That it peaked just after launch isn’t surprising, but the decline since then has been steep, especially given that few other games on Steam have the advantages it does. It’s still in the top 20 top selling games on Steam right now, but its popularity seems to be waning. It's still enough to get a multiplayer game right now, but we'll keep an eye on player trends and Valve's updates in the coming months. It’s had a pretty rocky start. At launch, it was review bombed over monetisation, and compared to other digital CCGs, it’s certainly pricey. 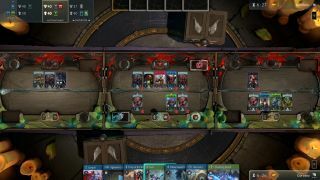 Artifact’s most expensive cards cost about the same as the game itself, sometimes more, which will set you back £16/$20. It’s not a game for people on a tight budget. These were issues raised in our Artifact review, but Will Bindloss still managed to find plenty to like about the game. Value for money, I'm well aware, is going to be a big factor for many looking to buy the game. But the strength of the design will be enough to keep me hooked. Not only is Artifact's depth remarkable, it also doesn't come at any great loss of accessibility. I'm excited to see the metagame develop over the coming weeks and months. Let's just hope Axe's price comes down a bit.